Share Your Three Wheeler Memorabilia! In case you hadn't noticed, a lot of really cool trike memorabilia has been popping up on the internet lately. Everything from RC three wheelers, to Hot Wheels trikes, posters, brochures, dealer pamphlets and all sorts of other really cool stuff. We want to see what you've got laying around! Hop over here to post up some of your stuff that you've got sitting up in your attic or hanging on your garage wall. Forum member MattDragontamer went out on a limb that no one else has. After the previous owner, the late Ken Sills, passed away, who was going to handle OEM parts storage and distribution was up in the air for the Taurus 650 three wheeler. He took hold of the entire collection of parts and is now handling things on his own. It's been quite a deal on his end to get everything ready for owners of these machines and he takes pride in trying to keep these machines alive for everyone to enjoy. Props to him for all his hard work. You can read his story and check out pictures of the stash here. AORP Trike Race Results...and the Fastest Female Trike Racer West of the Mississippi! Arizona Off Road Promotions trike race turned out to be a great event, with 9 trike racers in total competing to battle it out over a course that spanned a length of 45 minutes. However, on of the top racers was Giselle Johnson, who took 7th place, and her husband is challenging every woman out there to take her on for the title. A congrats goes out to Giselle, and to all the racers who participated. You can check out the results here, and can view race photos as well as leave your comments here. Social Media Kick: 3WW's Favorite October Trike Photos! Some of the greatest photos come from our members on all sorts of social media, and we understand that not everyone is into every type of social media that's out there; things like Instagram, Facebook, and even Snapchat. So, as we find pictures of sweet trikes around the net and across these social media, we'd like to compile our favorites and gather them in a place for those who are interested in these photos but aren't a fan of the social networks they appear on. Each month we will compile our favorites and feature them right here on 3WHeeLeR WoRLD for your viewing pleasure. If you think you've got a sweet shot you think we'd like and want to see it here next month, submit them to us either as an attachment in a comment below, to our Facebook page or via Instagram via hashtag #3wheelerworld. Send them in, we'd love to see them. Take a trip back to the past with our special feature for the month of November. If nostalgia is your thing, you won't want to skip over this one. If you've never heard of a Kawasaki Tecate 125, that's because it wasn't built by Kawasaki. But it is being built by forum member loizl, who set out to build a machine that was something Kawasaki never envisioned, which we all can agree was mighty unfortunate. The goal of the build was to put together a small, lightweight and most importantly, a reliable trike similar to a Honda 200X. So, under these parameters, he started building it from scratch. Beginning with a second generation 1987 Tecate frame, it was modified to similar geometry as a first generation Tecate frame but with a removable aluminum subframe and a single downtube to clear his exhaust. Powered by a Gianelli piped KMX125 2 stroke engine, expected horsepower is to be between 20-24, more so than a comparable 200X but very reliable. Choosing this engine proves to be a great choice in that it had a very long production run with very few changes, and it features a counterbalanced 6 speed, wide ratio transmission. The fenders are from a Honda Fatcat bike, a Kawasaki Mojave quad (including the seat), a headlight off a Tri-Moto 225 Yahama, and also features inverted 41mm front forks and custom made triples. He is also preparing an aluminum gas tank for the machine. This thing will absolutely rip when it's done. To read more on the build, view more pictures and leave feedback, click here. Remember that beautiful vintage racer US90 that we showed you a little while back? Well it's auction recently ended and 95% of the proceeds were going to benefit the Maine Cancer Foundation for cancer research. The winning bid was at $3,762! Congrats to the winner of the machine, and we are proud that our sport could make such an impact on such a big health issue in todays society. 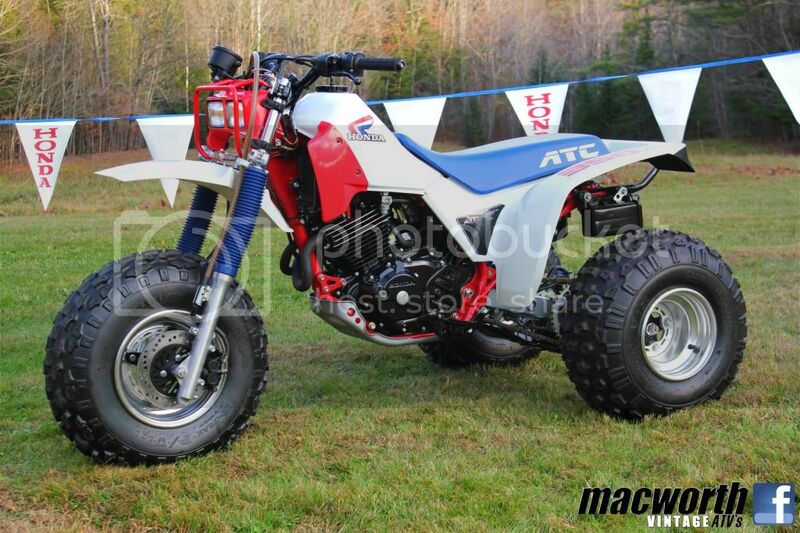 A special thanks goes to John MacDonald of MacWorth Vintage ATV's and Mike Palmgren of Vintage Motorsports for putting this machine together and for their efforts in trying to make the world a better place to live.